NASA's Terra satellite and NOAA's GOES East satellite have been just two of the fleet of satellites monitoring the life and death of former Hurricane Irma. Imagery from both of those satellites over two days show the movement of Irma's remnant clouds. On Sept. 13 at 12:20 p.m. EDT (1620 UTC) the Moderate Resolution Imaging Spectroradiometer of MODIS instrument aboard NASA's Terra satellite provided a visible image of the remnants of Hurricane Irma over the U.S. Midwest. The clouds stretched from Missouri to the southern tip of Lake Michigan in the Great Lakes. The MODIS image was created by NASA's MODIS Rapid Response Team at NASA's Goddard Space Flight Center in Greenbelt, Maryland. On Thursday, Sept. 14 at 3:34 a.m. EDT, the Discussion from the National Weather Service, Baltimore, Maryland/Washington, D.C. noted "The remnants of Irma will scoot toward the northeast and across Pennsylvania today then to southern New England tomorrow." On Sept. 14 at 9 a.m. EDT (1300 UTC) NOAA's GOES East satellite saw the remnant clouds associated with former Hurricane Irma moving over New England and the Mid-Atlantic. 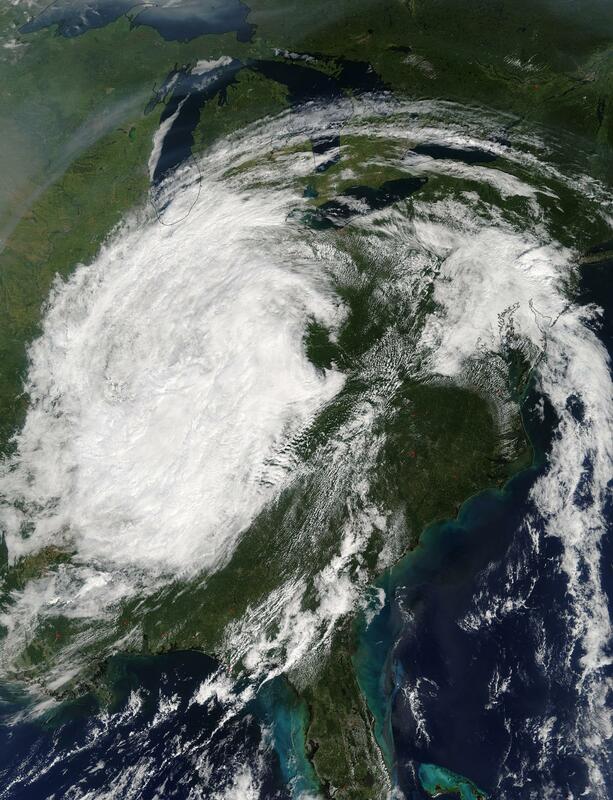 The low pressure system associated with the remnant clouds was moving over upstate New York today, Sept. 14 and moving toward the U.S. East coast. NOAA manages the series of GOES satellites and NASA/NOAA GOES Project at NASA Goddard uses the GOES data to create images and animations. The National Weather Service at Logan Airport in Boston, Massachusetts noted on Thursday, September 14, 2017, "The much weakened remnants from Irma will bring scattered showers and a few thunderstorms late today into Friday, but the vast majority of the time will feature dry conditions." Irma's remnants are expected to slide off the U.S. East coast on Friday, Sept. 15 and into the Atlantic Ocean. Rob Gutro NASA's Goddard Space Flight Center, Greenbelt, Md.